The Biggest Reason for failures behind Online Entrepreneurs is Bad Copywriting. Many at Times, Marketers think that the Descriptions in the Ads, The Sales letters are just spaces to fill with normal text. However, they don’t realize that the Spaces are the only reason why People buy on Internet. But no more, we have come up with a Copywriting Course to solve all your Troubles and help you to write Cash Pulling Sales Copy. If you’re looking to really ramp up your business profits this year, then you’ll want to discover the secrets of writing cash-pulling copy. This video gives you two important (yet widely overlooked) keys to writing great copy, plus you’ll find out the secret sauce that drives sales! Did you know your headline is the most important part of your sales copy? After all, no one will even read the rest of your sales letter if your headline totally stinks. Inside this video you’ll discover the three components of a good headline. Plus you’ll find out how to combine these factors for maximum cash-pulling effect! Your prospects just graciously granted you a few extra seconds of their time—can you hold their attention and interest with your sales letter opener? Most people can’t, which is why this video shows you the two best ways to keep your prospect’s eyes glued to your sales page! Your prospect are always thinking, “So? Who cares? What’s in it for me?” Your sales letter needs to answer these questions, or your offer will be dead in the water. Crafting emotionally driven, curiosity-arousing benefit statements is the key to making your prospects really want your product. And this video shows you the right way to brainstorm, develop and showcase these benefits for maximum conversions! If closing the sale was as easy as dropping an order button in front of your prospects, we’d all be rich. Turns out the key to really ramping up sales is by using a two-part call to action. So what are these two parts? That’s what you’ll discover inside this video, so don’t miss it! No matter how fantastic your offer sounds to your prospect, he’s still got that niggling voice in the back of his head saying, “This totally won’t work for me.” And if that voice is loud enough, you’re going to lose a sale. That’s why you need to reverse the risk by offering a guarantee. This video shows you the three keys to crafting a guarantee that actually boosts conversions AND reduces refunds! Surprising but true—just wait till you see it! If your prospects were six years old, they’d be skipping around you while chanting, “Liar, liar, pants on fire!” But since they’re adults, they just avoid your “buy” button like the plague. Inside this video you’ll find out how to overcome this common problem and get your sales flowing again! Did you know your P.S. is one of the most-read parts of your sales letter? That means a good P.S. can get prospects scrambling like crazy to your order button. And inside this eye-opening video you’ll discover five super effective ways to craft a response-boosting P.S.! Video 9: Good Things Come In Small Packages? Plenty of people are kicking their long sales to the curb in favor of high-converting short-form copy. Will it work for you? What are the secrets of writing effective short-form copy? You’ll learn the answers to these questions and more inside this exciting video! Video 10: Video Killed the Sales Letter Star? If you don’t have a video on your sales page, you may be leaving a whole pile of cash on the table. Watch this video to find out the four keys to creating high-converting video sales letters that outperform text-only sales pages! 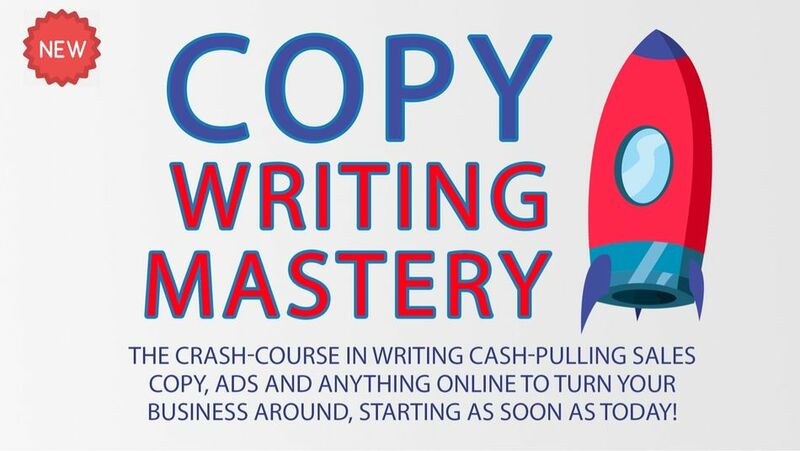 We want to help maximum people learn the Skill of Copywriting and hence we are Pricing this course very low so that even a Student can afford it.